Instruction in basic skills, such as reading, writing, arithmetic, and other skills required to function in society. Preparation for educational testing (in Language Arts, Mathematics, Science, and Social Studies) designed to provide a high school equivalency credential. 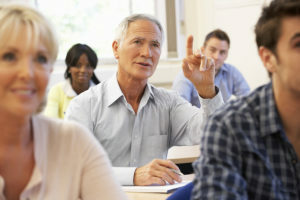 Teaching of English to people who speak a different language and who live in a country where English is the main language spoken, such as the U.S.